A fast-moving cold front passed through the Maritimes today on its way to Newfoundland. Powerful winds developed as a result which knocked out electricity to tens of thousands of customers across New Brunswick, Prince Edward Island and Nova Scotia. The Greater Moncton International Airport recorded a gust of almost 90 km/h late this morning with Cape Breton Island reporting winds of more than 100 km/h. Many locations across Newfoundland had hurricane-force gusts including Bonavista at 126 km/h, Wreckhouse at 107 km/h and St. John’s at 104 km/h. The cold front also affected Southern Quebec yesterday with gusts of more than 80 km/h in Montreal and Quebec City. A slow moving low pressure system brought a wintry mix of snow, ice pellets, freezing rain, rain and strong winds to Southern Ontario and Southern Quebec over the weekend. Icy conditions led to more than 1,600 highway crashes, numerous power outages from falling trees and downed lines, cancelled flights, transit delays and school closures. Officials were forced to close the CN Tower due to falling ice from the structure. Toronto Pearson Airport – 18 hours of ice pellets, 6 hours of freezing rain, 12 cm ice pellets. While the province itself currently basks in warmth, an Alberta Clipper moved through Central Canada dropping the first snow of the season to many parts of Southern Ontario and Quebec. About 12 cm of snow fell in Windsor, 10 cm at Toronto Pearson Airport and 16 cm in Ottawa. Environment Canada is forecasting even heavier amounts for Quebec City with up to 50 cm expected. The system also brought more than 30 cm of snow to northern New Brunswick with a mix of snow and rain in Greater Moncton. A low pressure system passed over the Bay of Fundy today bringing the second major snowstorm of the season with at least 20 cm for Southeast New Brunswick. Schools closed, flights were cancelled at the Greater Moncton International Airport and several car crashes reported as road conditions worsened throughout the day. Precipitation started as snow in Nova Scotia but later changed to freezing rain and then to rain as temperatures climbed above freezing. The same Colorado Low impacted Southern Ontario earlier today delivering 15-30 cm snow from Windsor to Ottawa including the Greater Toronto Area and Southern Quebec including Montreal and Quebec City. For many in Southern Ontario, this wintry wallop was the first major snowstorm of the season dumping about 15 cm of snow on Windsor, Toronto and Hamilton with 20 cm in Ottawa and 30 cm in Kingston. 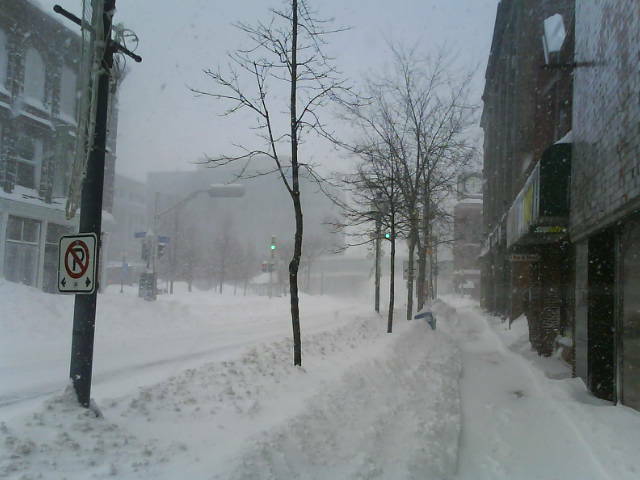 Montreal could receive as much as 40 cm of snow while Quebec City can expect about 20 cm. The storm actually originated in the American South dropping rare post-Christmas snow on cities like Dallas, Texas and Little Rock, Arkansas. After hammering the U.S. Northeast with snow and rain, the storm is now moving into New Brunswick and Nova Scotia with snow, strong gusty winds and rain along the Atlantic coast. Given how huge Canada is, the chances of having a White Christmas depend on where you live. The odds are less likely if you live along the West Coast, East Coast or Southern Ontario. The odds are more likely if you live in the territories, Northern Ontario, Northern Quebec, Labrador, Manitoba and Saskatchewan. In Greater Moncton, Environment Canada says from 1955-2011, we had a 74% chance of having a White Christmas with the odds less likely in more recent years.